(Rick Egan | The Salt Lake Tribune) Salt Lake City has installed ten traffic signal detectors, which use a radar device that is triggered by people riding bicycles, to help bicyclists cross the street when no traffic is around. Wednesday, Aug. 1, 2018. The Utah Legislature is considering a bill, HB161, that would allow cyclists to legally go through stop signs without a complete halt when intersections are clear. It is the fourth time that Rep. Carol Moss, D-Holladay, has attempted to pass the bill, which cleared the House last year but died in the Senate. (Scott Sommerdorf | The Salt Lake Tribune) Rep. Carol Spackman-Moss, D-Holladay. But the Utah Department of Transportation and the Utah Highway Safety Office questioned the safety of running red lights. So did Rep. Merrill Nelson, R-Grantsville, the only committee member to oppose the measure. “It seems counterintuitive to me that it is safer to run a stop sign than to stop,” he said. 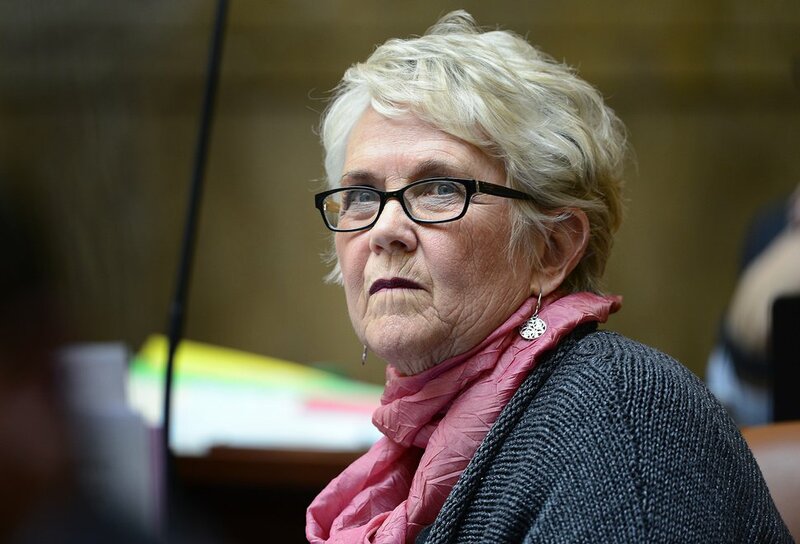 “A lot of things that are true are counterintuitive,” offered Rep. Marsha Judkins, R-Provo, who said the bill will encourage more biking and help reduce air pollution. Idaho has had a similar law for years, and Delaware recently passed a law to allow cyclists to run stop signs but not red lights. Moss said studies found those laws did not increase accidents nor fatalities, again perhaps because it reflects what most cyclists do anyway. The committee also was scheduled to debate a bill that would allow motorists to run red lights after stopping if intersections are clear. But HB151, sponsored by Rep. Ken Ivory, R-West Jordan, was held over for later debate.